Overshadowed by the Ebola outbreak in the Democratic Republic of the Congo (DRC), another frightening virus is on the loose in that vast, chaotic country: polio. Public health experts have worked for months to stamp out the virus, but it keeps spreading. It has already paralyzed 29 children, and on 21 June a case was reported on the border with Uganda, far outside the known outbreak zone, heightening fears that the virus will sweep across Africa. 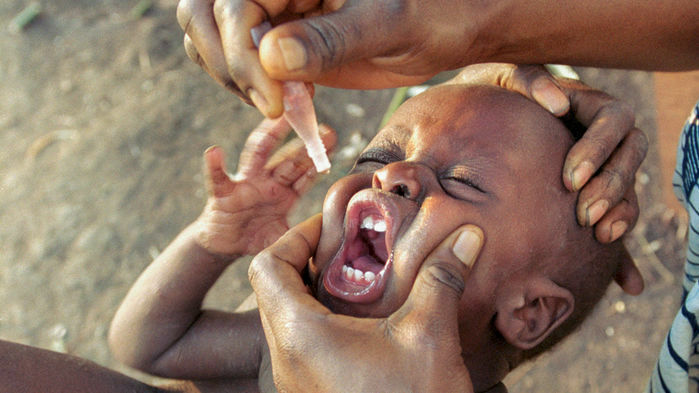 The DRC is “absolutely” the most worrisome polio outbreak today, says Michel Zaffran, who heads the Global Polio Eradication Initiative (GPEI) at the World Health Organization (WHO) in Geneva, Switzerland. The outbreak also underscores the latest complication on the bumpy road toward polio eradication. It is caused not by the wild virus hanging on by a thread in Afghanistan, Pakistan, and perhaps Nigeria, but by a rare mutant derived from the weakened live virus in the oral polio vaccine (OPV), which has regained its neurovirulence and the ability to spread. As OPV campaigns have driven the wild virus to near-extinction, these circulating vaccine-derived polioviruses (cVDPVs) have emerged as the greatest threat to polio eradication. If the outbreaks are not stopped quickly, polio scientists warn, they could spiral out of control, setting eradication efforts back years. Safe and effective, OPV has long been the workhorse of the eradication effort. But a feature that makes the vaccine so powerful can also be a serious downside. For a short time after vaccination, the weakened live virus can spread from person to person, boosting immunity even in those who didn’t receive the polio drops. But in rare instances, in poor countries such as the DRC where many children have not been vaccinated, the virus can continue circulating for years, accumulating mutations until it reverts to its dangerous form. The vast majority of cVDPVs are caused by serotype 2, one of three variants of the virus. Almost as soon as cVDPVs were discovered in 2000, the World Health Assembly in Geneva declared that all use of OPV must stop when the wild virus was gone. In 2016, with the threat of cVDPVs looming larger—they now cause more cases of paralysis than the wild virus—GPEI decided waiting was no longer an option. By then, poliovirus type 2 had been eradicated in the wild, which meant that every type 2 virus originated from the vaccine itself. In April of that year, the 155 countries still using the trivalent vaccine, which targets all three polio variants, replaced it with a bivalent vaccine with the type 2 component removed. No one knew exactly how this experiment would play out. It was clear, however, that for a few years some type 2 outbreaks would still occur—either those that had started before “the switch,” as it is called, but had not been detected or those caused by the last use of trivalent OPV. In a virological catch 22, the only way to stop type 2 outbreaks is with a version of the same vaccine that gave rise to them in the first place—somehow without seeding another one. The virus in the inactivated polio vaccine cannot revert, but it simply does not pack enough punch to stop an outbreak. To fight these outbreaks, GPEI created a closely guarded stockpile of a new monovalent OPV type 2 (mOPV2), which can only be released with the approval of the director-general of WHO. If mOPV2 is used judiciously and sparingly, it can stop an outbreak without starting a future one, Zaffran says. Speed is essential because population immunity to the type 2 virus is waning now that it has been removed from the vaccine, setting the stage for an explosive outbreak. The type 2 vaccine has been released to fight outbreaks in 10 countries, and so far the strategy seems to be working, although a type 2 outbreak in Syria paralyzed 74 children before coming under control last year. The outlier is the DRC. The outbreak was first detected in June 2017 in Maniema province in the middle of the country. Within days, another case was reported about 900 kilometers away in Haut-Lomami province in the southeast. Genetic analysis revealed it wasn’t the same strain as in Maniema, but a type 2 cVDPV that had emerged independently. Even worse, the sequences indicated both had been circulating undetected for at least 2 years. The country and its international partners targeted mOPV2 campaigns to eight health districts deemed at highest risk—the minimum, experts thought, to get the maximum effect. But vaccination campaigns in the DRC, with its remote villages, crumbling infrastructure, and weak health system, are tough. They failed to reach enough children. The Haut-Lomami virus broke through, spreading south to Tanganyika and then Haut-Katanga. In the worst case—if type 2 explodes across Africa, or if case numbers shoot up exponentially—the only option would be to reintroduce OPV2 into routine immunization, says Mark Pallansch, a molecular virologist at the U.S. Centers for Disease Control and Prevention in Atlanta. The switch will have failed, turning back the eradication clock years and ratcheting up costs, which now run about $1 billion a year, to the dismay of tapped-out funders.